(Glendora) – Azusa Pacific jumped out t0 a 23-0 first quarter lead and rolled to a 61-0 thrashing of Simon Fraser Saturday night at Citrus College. The Cougars scored early and often and were off and running right from the opening bell. 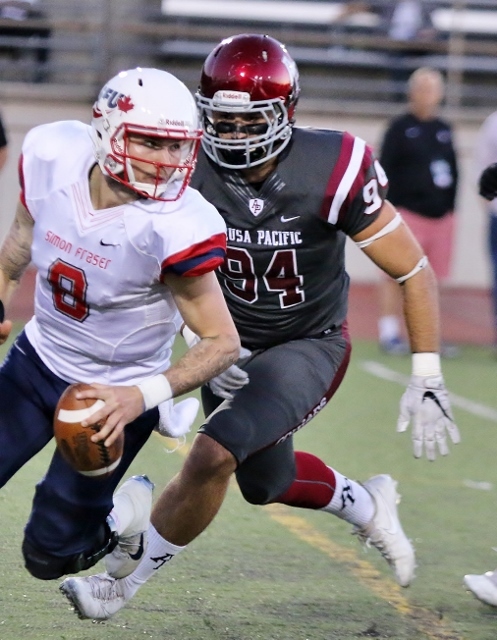 Simon Fraser was forced to punt on its opening possession and Azusa Pacific set up shop at the 50-yard line. The Cougars immediately cashed in as Andrew Elffers finished a drive with an 11-yard touchdown run for a 7-0 lead. After another quick three and out for Simon Fraser, Elffers went to the air and found Weston Carr in the corner of the endzone for a 31-yard touchdown with 8:27 left. 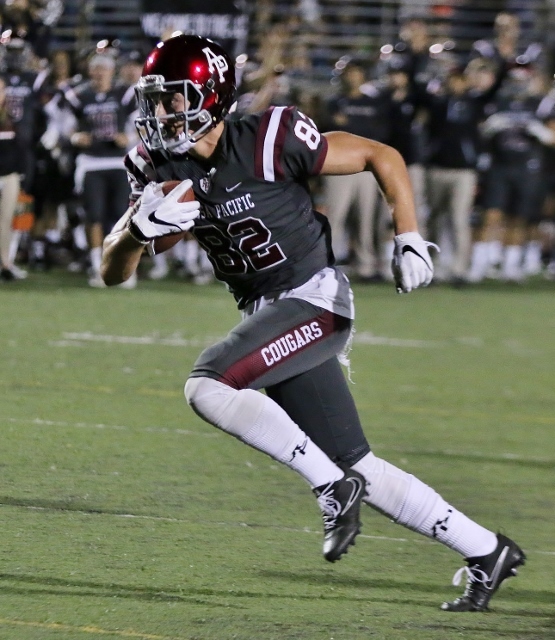 APU’s defense forced Simon Fraser to punt again and the Cougars wasted no time in scoring again. The Elffers – Carr connection worked again – this time for a 16-yard touchdown and a 21-0 first quarter advantage. On the ensuing possession, Simon Fraser took a knee in the endzone for a safety to increase the Cougar lead to 23-0. Simon Fraser marched all the way down to the Cougar two-yard line early in the second quarter only to have Josh Olave intercept Miles Richardson’s pass in the endzone. Later in the quarter Kurt Scoby broke off a 33-yard run down to Simon Fraser five-yard line and then scored on the next play to put the Cougs up by 30. Azusa Pacific scored one more time just before the half as Elffer fired a four-yard touchdown pass to Jordan Bogardus with five seconds left for a 37-0 lead at the break. Elffers was 11 of 18 for 177 yards and three touchdowns in the first half while Scoby had four carries for 38 yards and a score. Carr had nine receptions for 162 yards and two touchdowns. The Cougars started the second half the same way they finished the first. Elffers capped the opening drive of the third quarter with a 16-yard TD strike over the middle to Bogardus who brushed off a tackle at the five and rumbled into the endzone. Tyrone Williams replaced Elffers at quarterback on the following series and led the Cougars offense down the field again. However the drive was halted at the Simon Fraser seven-yard line and APU settled for a 24-yard Jacob Hall field goal late in the third quarter. 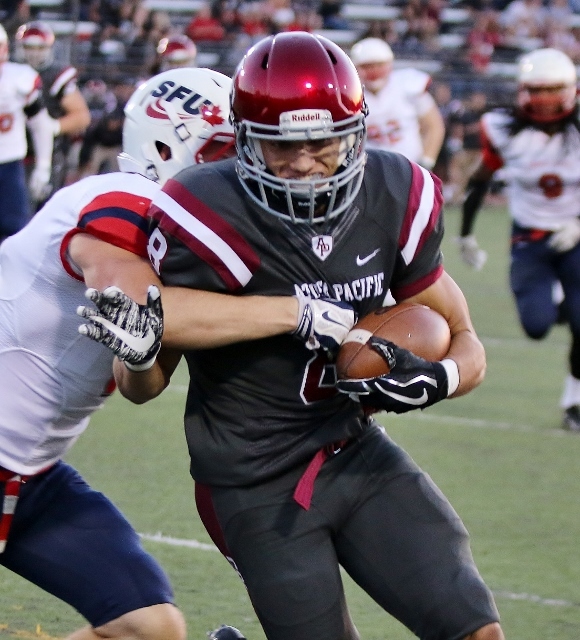 In the fourth quarter a blocked punt set up Azusa Pacific at the Simon Fraser 15. Three lays later Preston Campbell, in relief of Williams, scored on a one-yard keeper. On the next possession Ray Riley went 13 yards up the middle to paydirt and the Cougars were living in the sixties at 61-0. Elffers finished with 247 yards through the air on 15 0f 23 and four touchdowns. Carr had 10 catches for 178 yards and two scores. Jason Schwartz led the Cougar defense with four sacks as they blanked Simon Fraser. With the victory APU improved to 5-3 overall and 3-3 in the GNAC. Simon Fraser fell to 0-7 and 0-5 in conference.